Lamb is such a versatile meat. You can roast it, casserole it, grill and bbq it, whatever you have the time or the taste for. 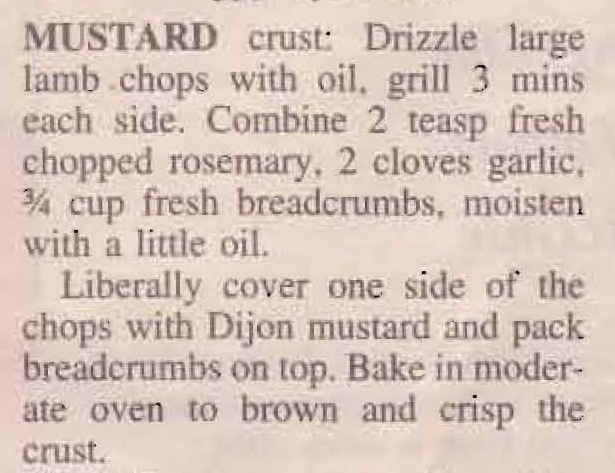 The page of lamb recipes that Mum kept from July 1997 showcases this versatility. This recipe give a basic lamb chop a real lift and makes a change from just eating it with tomato sauce. This entry was posted in All Recipes, Lamb, Main Dishes and tagged 1990s, breadcrumbs, garlic, grilled lamb chops with mustard, lamb chops, lamb chops with mustard crust, mustard, rosemary by bebsrecipes. Bookmark the permalink.